Mil Std 105e Explained in Simple Terms. Mil Std 105e is an attribute sampling plan. The standard contains tables and reference material that you can use to plan and conduct inspection. The US military obsoleted this in February 1995. However ANSI / ASQ transferred the entire text to Z1.4 which is still available today. Many government specifications contain requirements to use 105e during inspection. 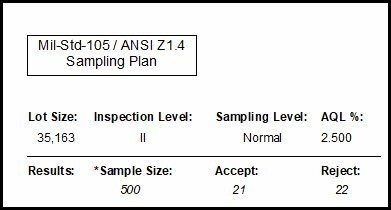 Since the military and other government agencies used the standard for sampling plans, manufacturers decided to use this standard too. Of all the possible Military and commercial sample plans, Mil Std 105e is the king. Although replaced by Z1.4, companies still invoke 105e in their inspection documents. Mil Std 105e can be used to inspect AQLs down to .01 percent or higher. Do not use the standard to inspect product with quality levels in the ppm range. Manufactures used the standard for inspection in many areas. Most of the time manufacturers use the standard for inspection of end items or Final Inspection. Other areas include receiving inspection, inprocess, product in storage, records, and administrative procedures. Auditors also used the standard to create sampling plans. The standard is written for the inspection of lots or batches. These batches must be produced in a stable environment. The standard defines the batch or lot as a collection of units. The lot consist of product from the same type, class, composition, and size. It must be manufactured under the same conditions at the same time. Manufactures must positively identify the lots, keep the lots intact and stored in a suitable space. Mil Std 105e includes tables for reduce inspection. Reduce inspection means you sample less parts during the inspection. To proceed with reduce inspection, you need to have 10 or more lots consecutively pass inspection. The total number of defects from those 10 lots must be less than specified in a table in the standard. In addition the production must be at a steady rate. If you reject 2 out of 5 lots then you need to go to tighten inspection. Tighten inspection means you sample more parts during the inspection. To return back to normal inspection, 5 consecutive lots with tighten inspection sample size must pass inspection. Level I. Select this level when inspecting minor features. Useful for features of minor importance. A minor defect will not prevent the part's usability for its intended purpose. It provides less protection to the customer. You will incur the least inspection costs with this plan. Level II Select this level when inspecting features of major importance. A major defect is likely to result in failure when the part is used but it does not cause a hazardous or an unsafe condition. Compared to the other inspection levels, it has normal inspection costs and normal customer protection. When in doubt, start with this inspection level. Level III. Select this level when inspecting features that could cause critical defects. A critical defect causes a hazardous or unsafe condition. This inspection level provides the best protection to the customer. When using this plan you will encounter the highest inspection costs. S-1. Select this level when the act of inspection damages or destroys the inspection part. Use this inspection level only if the inspection costs are extremely severe to your company. It provides the lowest protection to your customer. S-2. Select this level when the act of inspection damages or destroys the inspection part. Useful for features of minor importance. A minor defect will not prevent the parts usability for its intended purpose. It provides less protection to the customer. You will incur the least inspection costs with this plan. S-3. Select this level when the act of inspection damages or destroys the inspection part. Useful for inspection of features with major importance. A major defect is likely to result in failure when the part is used but the failure does not cause hazardous or unsafe condition. When using this plan you will encounter lower inspection cost. S-4. Select this level when the act of inspection damages or destroys the inspection part. Use this plan when inspecting features that could cause critical defects. Critical causes a hazardous or unsafe condition. When using this plan you will encounter lower inspection costs. If you purchase Snap Sampling Plans!, Mil Std 105e is built into the software. You don’t need to worry about the tables and reading the standard. The software is easy to use and includes other sampling plans too! As a bonus, I include the complete Mil Std 105e document with the software download.